The Roman conquest of Jerusalem was made possible by Pompey’s victory in the Third Mithridatic War. His reward for that campaign was sole control of the province of Syria, which gave him unlimited access to the eastern Mediterranean. At the height of his power he commanded eleven legions and 600 war galleys. That pretty much gave “Pompey the Great” the power to do anything he wanted. Fortuitous circumstances and a well-placed bribe put Jerusalem under Pompey’s control in 63 BC. Rome’s grip on the Holy City was further solidified in 37 BC when Mark Antony helped biblically famous King Herod win the throne of Judea. This was the situation in Jerusalem when Christ was born. As we enter the Easter season in Italy it’s important to understand this because the political climate was a major factor in the story of Pontius Pilate and the Crucifixion. 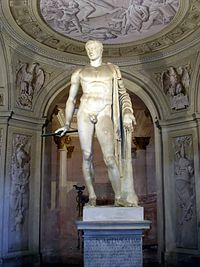 The death of Antony and Cleopatra in 31 BC gave Octavian, who would become Emperor Augustus Caesar in 27 BC, control of the entire Mediterranean coastline. 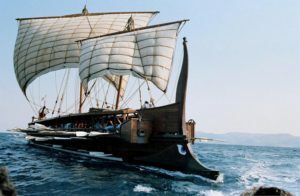 Fleets of deadly Roman triremes traversed the sea from end to end and held station at fortified ports like Portus Julius in Campania and Messina in Sicily. It was from these ports that Roman civilization, spawned on the banks of the Tiber River, was carried to the rest of the known world at the time. Of course, not all of what Romans brought to the world around them originated in Rome. Their conquest of Greece, Persia, Egypt, and Jerusalem provided them a wealth of knowledge that they assimilated into their culture. These foreign influences can be seen when you visit port cities along the Amalfi Coast, Sicily, and Sardinia, which is one of the oldest inhabited islands in the world. The most comprehensive collection of ancient Roman artifacts from the days of Pompey and Julius Caesar can be found at the Vatican Museums. Be sure to check out their exhibit “Inscriptions from the Excavations of Ostia.” The predominantly military region of Ostia was a marshaling ground and seaport that launched many of Rome’s campaigns of conquest. It can be seen today as Ostia Antica, an archeological site where ancient artifacts of the empire are still being uncovered. If you’d like to learn more about Jerusalem prior to Roman occupation, visit the “Antiquities of the Ancient Near East” exhibit in Room VIII. This is where the Dead Sea Scrolls are housed, with other ancient Palestinian and Egyptian artifacts. There are also some interesting objects from the necropolis of Jericho. After reading this and our previous post we guarantee that you’ll find these exhibits fascinating. 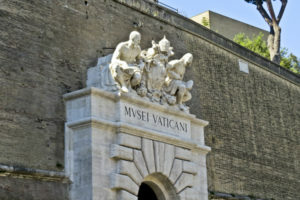 Go over to our main site to purchase a ticket to visit the Vatican Museums. While you’re browsing the Vatican Museums, make it a point to stop at St Peter’s Basilica and say a prayer. Lent begins next week and we here at Weekend in Italy will be starting off the Lenten season with an article about the origins of Ash Wednesday, then following up with a series of posts about the evolution of Christianity through Italian influence. Please come back Monday to read more.